Sore throat is a problem common among all ages, all genders and all races. It might be safe to say that sore throat is one of the most common health problems in the world. However, its being common does not undermine its implications. A person with a sore throat has problems swallowing, and most importantly, speaking. This is bound to make one extremely irritated. There are hundreds of drops available for sore throats. Based on the number of people suffering from it; the product owners have invested a lot of money over the years advertising their particular brands. We all have seen numerous commercials, where a person with a sore throat after having xyz drops is available to speak clearly and with ease. The media archives are overrun with such communications. 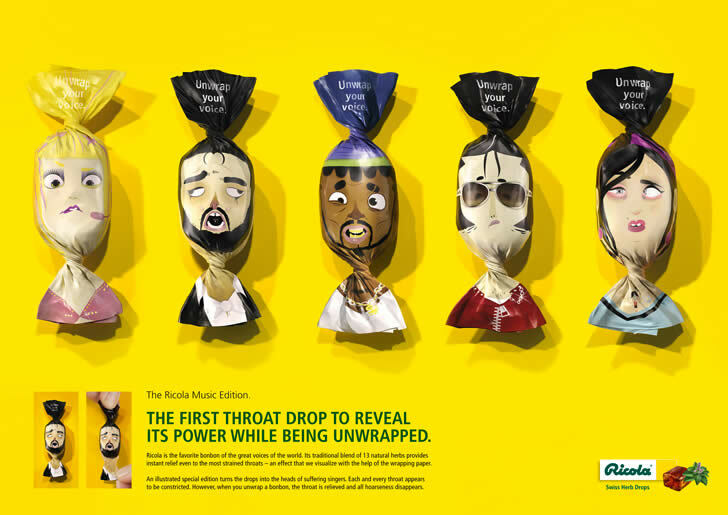 The same monotony can be found in the print campaigns of various throat drops. This posted a challenge for the creative team at JVM Studio. Having a master illustrator like Julien Canaveses on their panel, team JVM provided a solution for their client Ricola’s Herbal Drops like none other. They concentrated on the very basics. All said and done; however glamorous a campaign may be, the actual star is the product itself, a fact well understood and brought to light. A product’s packaging should have enough creativity and visual attraction to speak out to the consumer. The packaging for Ricola’s is a picture perfect example. The wrapped sweet area, instead of showing typical Eucalyptus leaves and cool waves, shows various irritated faces. The twist however comes a little lower. The problem that these drops address is sore throats and the hoarse voices that come as a perk. 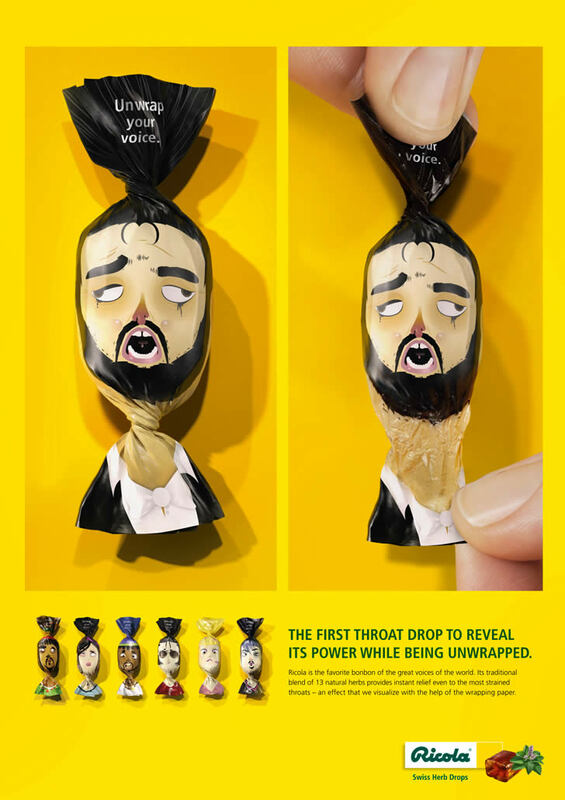 The face on the packaging continues towards the flow end, where the throat is twisted in order to pack the drops. This is an excellent cliché of the feeling one has with a sore throat. 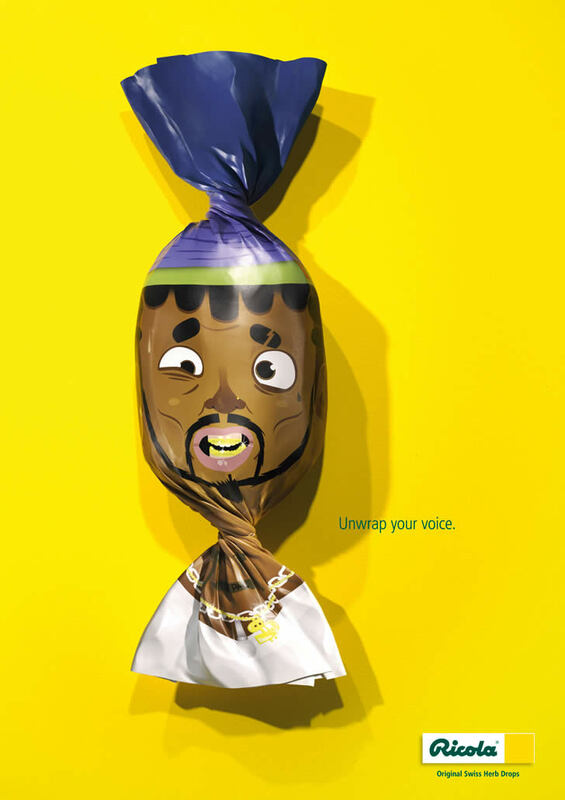 The print campaign shows various packaging on these lines with the tagline, “Unwrap Your Voice”. 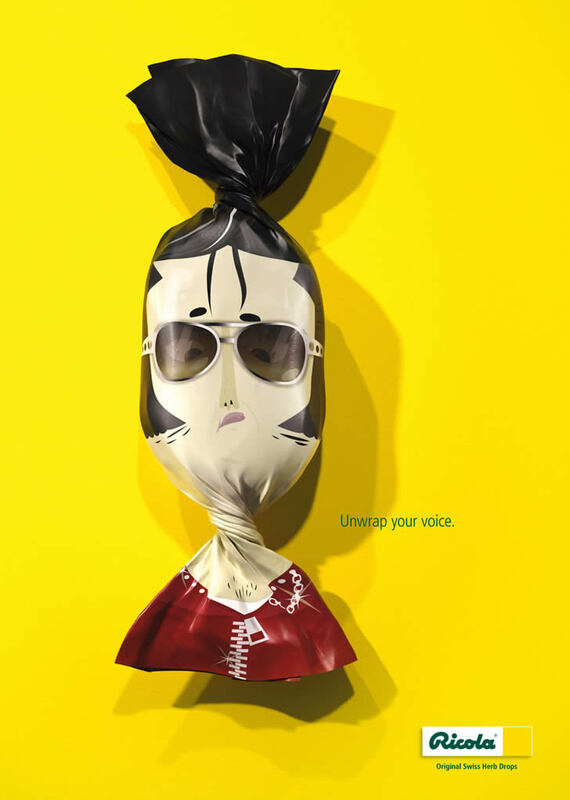 The strong call to action line and the visuals result in a campaign that is extremely creative yet simple to its core. The packaging was made more attractive by using illustrated faces of icons like Elvis Presley and others. This campaign is a must watch and I guarantee that after viewing it; sore throat or not, you would want to have one of these drops and experience the amazing consumption ritual.